Ladies and gents, welcome to the silly superstar season in televisionland, with three of the country's biggest stars appearing at least three nights a week. We've heard the hype, sat through the inevitable promos, and read all about the rumoured mega-crore deals -- the 'rumoured' bit being exactly how much they're getting, not that they're as massive -- and we've been ready. Each of them has turned out to be a disappointment, leaving channel heads scratching their heads and wondering what to do about those starry overheads and dipping ratings. Well, they have themselves to blame for not having thought things through. First came Shah Rukh Khan and his Kya Aap Paanchvi Pass Se Tez Hai, a good concept so badly messed up by the production house that the star turns up every other day jiving with a housewife while his brand value plummets. As mentioned, the problem is a conceptual one: The hilarious American show Are You Smarter Than A Fifth Grader is based on the average American stupidity curve, which is why they mess up answers like 'Two times Five equals?' The Indian version, while replacing stand-up comic Jeff Foxworthy with the biggest superstar in the biz, has gotten the formula completely wrong. The fifth-grader questions on Paanchvi Pass are often genuinely tricky (to me and the general populace, not you know-it-all quizzers) and while they are surely found in NCERT textbooks from classes 1 to 5, the whole point of this show is to ask people questions the audience already knows completely. Right now, they're all just KBC-2 episodes set in a classroom -- and we certainly don't want to see that. Salman Khan and his 10 Ka Dum suffer from different reasons. As I had once detailed before the show started, the original is a pretty darned lame format to begin with. The percentages are arbid, the questions are banal, and you're basically just playing a five-question lottery. The reason Power Of Ten works in the US is because of host Drew Carey. The questions are ridiculous and they go well with Drew's trademark style of stand-up. So is Salman not funny? Um, no, to put it politely. Stand-up and improvised comedy isn't everybody's cup of tea and while Sallu manages very well with the celebrity episodes -- the one with Yuvraj Singh and Bhajji was a delight -- he can't riff that well the rest of the time. Cut the hype talk, and I bet Jaaved Jaffrey'd do a much better job. And finally, there's the biggie. An overpaid Akshay Kumar mucking up Fear Factor, something I'm not going to really detail having reviewed it just three days ago. Suffice it to merely mention that Akki doesn't jump, doesn't lie in a pit of snakes, doesn't really do anything beyond Hum Log impressions to a group of perplexed women -- the majority of whom were born well after that show ended. Not smart, though Akshay's career still seems bulletproof: the series looks to be only about three Monday-Thursday weeks long (one out of 13 contestants is eliminated every episode), and there are enough very fun Singh Is Kinng promos on the air to make up for this dud. We look to the US and the UK -- if not for any other reason than to see the shopping mall where our producers buy their formats off the shelf -- and the very idea of the game show is about the common man. Regis Philbin made a career out of hosting Millionaire, and Simon Cowell's Idol scowls have made the man more billions than a hung parliament can frown at. A great format is an ideal platform to launch new, exciting talent. It's an opportunity to find a fresh young host, a face to surprise, a personality to shock. Give us audiences someone new. Have your celebrity episodes every now and then, but keep your host regular -- someone who embraces the format instead of overwhelming it. Why on earth must a good concept need a celebrity at all? These are three failures, based largely on three stars who are bigger than their gameshows. 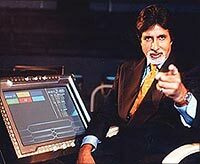 Sure, Amitabh Bachchan rose to legendary success with Kaun Banega Crorepati but that was at a different time, when his cinematic star was waning. He didn't touch television back in the glory days, a very mature stance. Just when India had all but lost hope in the man's films, he walked into our living rooms, dressed in an immaculately tailored suit and speaking Hindi like only he can, in that voice, and we were hooked like never before. And never again. With superstars crawling through our ears -- promos, billboards, endorsements, interviews -- they have very little to offer that we haven't seen before. A game show hosted by Hrithik Roshan might conceivably work because he's doing lesser films. It might be interesting to see facets of his personality coming out as a host, for how many of us can say we know Hrithik? On the other hand, these guys we have pretty clear opinions on. Shah Rukh and Akshay might be the most overexposed stars in the country today, and Salman's close enough. And they're still trying to show us more, nudge us into laughing, get us glued to the screen. Meh. Well guys, you know what? Try harder. Jump higher. Dance faster. Whatever. Unless you really do something radically different, we aren't buying it.